13 best Christmas gift ideas for music fans | What Hi-Fi? You won't find a Christmas compilation CD (or vinyl, for that matter) anywhere in this list. Indeed, if music is the food of love, then forks at the ready - we’ve got a finger-licking festive feast for you. Stocking-unfriendly vinyl is still relentlessly all the rage, so if the music fan in your life hasn't yet taken the plunge, this entry-level Pro-Ject offers a reliable and fuss-free way in to record spinning. It's more concerned with sound quality and quick-and-painless set-up than all the (jingle) bells and whistles of USB recording and the like, but for £150 who can argue with that? They'll have vinyl albums rockin' around the record spindle in no time. Wooden A-Z record organisers - because naturally, half the fun of any physical media is organising it. We can't think how Benjamin Franklin's "for every minute spent organising, an hour is earned" quote can be applied to organising vinyl in any way (unless, of course, your friend has such a large collection that it takes them an hour to find one), but think how rewarding it'd be! And a great post-leftovers Boxing Day activity. Not for folk who sort by genre, obviously. To unashamedly steal a line from our review, £200 for a pair of hi-fi speakers seems to buy more quality than ever nowadays. These Q Acoustics bookshelf speakers are excellent My First Speakers, so if the budget allows you could really help someone on their way to a decent hi-fi system. And you could wrap each speaker individually so that it counts as two presents, right? How about giving the gift of music itself? While Tidal may be our favourite music streaming service for its CD-quality streaming and hi-res Masters, it's easier to gift someone unlimited music access on the most popular streaming service on the planet. A Spotify Premium subscription costs a tenner a month, so we don't need to tell you how much one for one-, or three- or six-month period would set you back. Yes, we know that thing in your pocket can do everything: web browsing, tweet posting, call making and indeed music playing. But when it comes to the latter, a portable music player like the Cowon Plenue D can do it better. This one nails our performance-per-pound ethos particularly well, and hi-res support, 32GB built-in storage and a microSD card slot are also on the menu. The Beatles aren't the only ones celebrating the 50th birthday of a seminal album (The White Album) this year. The Doors' only number one album, Waiting For The Sun, has got a milestone remastering and reissue for the occasion. The two new CDs have been encoded with the MQA (Master Quality Authenticated) process, meaning that if a conventional CD player is connected to an MQA-enabled device, it can play the disc back at its original sample rate. What better way to express some, ahem, Wintertime Love for fans of The Doors? Alternatively, the MQA version of the album can be downloaded. After the weariness of Christmas festivities, you'd forgive someone for craving some convenience. And what more convenient than a compact, wireless, noise-cancelling pair of headphones? A What Hi-Fi? 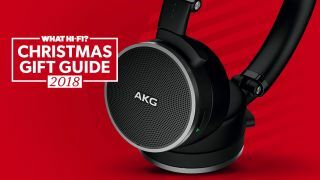 winner no less, these five-star AKG cans not only sound great but are also comfortable and have effective noise-cancellation - ideal for both on-the-go listening and silent nights, holy nights at home. We've been enamoured with Ruark's R1 radio since it first graced our test rooms six years ago, and our affection for it has been reignited now that it's available in two striking new colours: Burnt Saffron (pictured) and Wild Plum. Now in its third generation, it marries FB/DAB radio with Bluetooth, a 3.5mm input and a compact bedside-friendly build that will no doubt fit neatly underneath the Christmas tree. If a song has a special meaning for you - first dance? Holiday memory? First to make your cry? - this is a great way to celebrate it. It's a bespoke service - tell them (‘Mika’) the name of the song, and they'll work the lyrics into the soundwave and print it in either gold, silver or copper foil onto any colour card you like. Underneath is artist, song and release year, and the whole thing is then presented in a white and oak frame. We van vouch for the quality, too. If a portable music player is a little out of your price range, then how about a portable DAC to boost the sound quality of a smartphone? Cyrus' USB stick digital-to-analogue converter can do just this as the middle man between your smartphone (or laptop) and headphones. There's a cable for micro-USB smartphones and another for laptops. If your music lover in mind has an Apple device, they (or you) will need to purchase a Apple camera kit adapter. Want to learn to play guitar? There's an app for that. Iconic guitar manufacturer Fender has launched a subscription service of guitar-playing tutorials for those with musical aspirations themselves. The tutorials cater for all levels and bass, guitar and ukulele preferences, and you can sign your giftee up for the monthly plan or even commit to an annual subscription (and save 10 per cent in the process) - after all, when they're raking in millions and being heralded as the next Jimi Hendrix in Mojo, you'll be able to remind them who to write a cheque to. And to think we almost forgot the best hi-fi magazine around – how Rudolph us! Looking for the Ultimate year-round gift? In an overt act of shameless self-promotion, we can’t help but suggest our own physical form as a pressie for anyone who not only likes listening to music but also reading about the kit that's best to play it (and films) on.